(AP) MIAMI - When Burger King (BKC) set about to fix its ailing empire, the fast food giant started by scrutinizing everything on the menu - even the mayonnaise. A group of Burger King executives and franchisees last year sat through a lengthy presentation complete with charts and graphs on how oils and eggs affect the quality of the spread. A blind taste test of 30 varieties followed. The verdict: They liked the one Burger King was already using. "That was actually a pretty hard day," recalls John Koch, Burger King's executive chef. It wasn't the only one. Over the past year, Burger King evaluated all of its ingredients from the bacon to the cheese slices it serves on its chargrilled burgers as part of a yearlong quest to reverse years of slumping sales of its Whoppers and fries. The result: On Monday, it plans to launch a lineup of smoothies, frappe coffees, chicken strips and snack wraps. The 10 new items mark Burger King's biggest menu expansion since the chain opened its doors in 1954. Burger King's food odyssey shows how grueling it can be for a fast-food company to come up with new menu items - a process most Americans aren't aware of when they're handed a bag at a drive-thru window. Burger King is the latest chain to revamp its menu as part of the fast-food industry's move away from its nearly single-minded courtship of young men. Once the lifeblood of the industry, the economic downturn hit those junk food fanatics particularly hard. At the same time, Americans' generally have been demanding healthier options. Burger King has failed to evolve even as competitors have gone after new customers with breakfast items and healthier fare. Last year, Wendy's (WEN) for the first time edged out Burger King as the nation's No. 2 burger chain behind McDonald's (MCD). To stem the decline, Burger King executives last year decided to remodel its aging system of 7,200 stores to make them more contemporary, redesign worker uniforms with aprons so they stay clean and even serve the iconic Whopper in cardboard cartons instead of paper burger wrapping for the first time in more than 20 years. The food, however, is at the heart of its plan. Consumers have longed for more food options at Burger King, but the revamp is a gamble. The new menu may not go far enough to differentiate Burger King from its competitors. After all, there are striking similarities between Burger King's new items and the offerings of its much-bigger rival McDonald's. The Golden Arches already rolled out specialty salads in 2003, snack wraps in 2006, premium coffee drinks in 2009, and fruit smoothies in 2010. "Being an innovator is critical in the fast-food industry," said Darren Tristano, an analyst for food industry researcher Technomic Inc. But in recent years, he said Burger King has been more of a follower. Burger King executives don't deny that its new items are pretty close to those on McDonald's popular menu. But they say the new menu was created as a result of Burger King's own research. "Consumers wanted more choices," said Steve Wiborg, president of Burger King's North America operations. "Not just healthy choices, but choices they could get at the competition." The fast-food industry has undergone a shift in recent years. Just five years ago, the top three fast-food companies were all burger chains. But concerns over obesity have paved the way for competitors like Subway, now the second-biggest chain, and Starbucks (SBUX), which climbed up the rankings to the No. 3 spot. Smaller players such as Five Guys, which sells made-to-order burgers, are gaining ground too. McDonald's quickly adapted. The world's biggest burger chain reinvented itself as a hip, healthier place to eat by offering wireless Internet and rolling out a string of hit menu items such as fruit smoothies, iced coffees and oatmeal. Burger King failed to keep up. Its share of sales among burger chains fell from 17 percent a decade ago to 12 percent last year, according to researcher Technomic. McDonald's share rose from 42 percent to 50 percent. All Tom McDonald had to do was look at Burger King's competitors to see why sales at the chain were falling. A Burger King franchisee since 1989, McDonald said the chain's menu hadn't changed much over the years. "We were getting behind with the wraps and salads that were coming on the market," said McDonald, who owns 19 franchises. "We had salads, but they weren't as good as the competition. We focused on burgers maybe longer than we should have." McDonald said he expressed his concerns at the company's failure to keep up with the times. But the Miami-based chain had gone through a series of owners over the years, and McDonald said he got little response from corporate about addressing the problems. He said the attitude from the top changed, however, after New York-based private equity firm 3G Capital bought Burger King last year. That's when Burger King assembled a group of 15 key executives, franchisees and suppliers to evaluate the chain's menu, item by item. The process, which took three months of daylong meetings, was grueling at times. French fries took multiple days, given the various factors like seasoning, oil and frying method. Even the day for soft-serve ice cream, which was rolled out last summer, wasn't as fun as it might sound: A supplier that had 400 vanilla flavors presented the nuances between Madagascar and honey vanilla. "Trying to come up with the exact intensity of vanilla you need is a little bit daunting," said Koch, Burger King's chef. Burger King quietly put some changes in place over the past year. The French fries are thicker so they'll stay hot longer. Burgers now come with one slice of cheese instead of two, so it melts more evenly. And naturally-smoked bacon is now cooked at each restaurant. 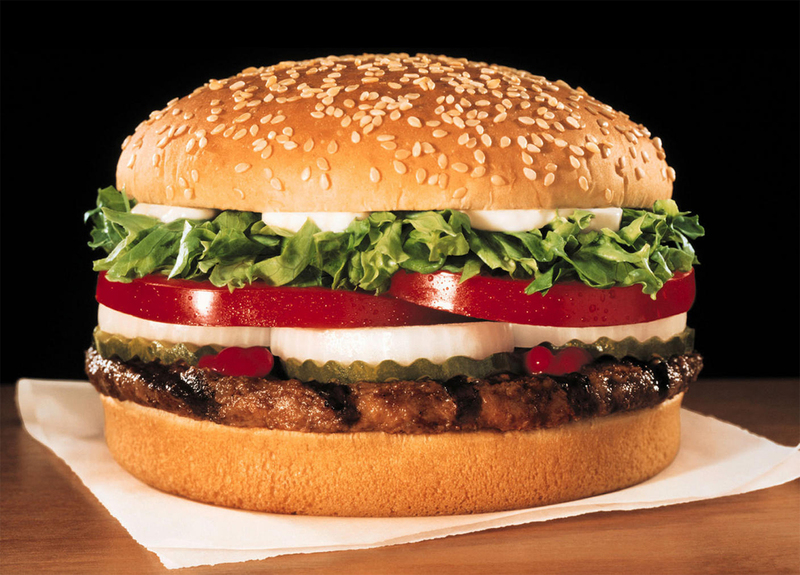 Previously, Burger King had used a pre-cooked variety with a smoked flavor sprayed on. Once executives settled on menu items, it was time to go to the masses. Would the new items measure up to those of Burger King's competitors? To find out, the company conducted consumer tests and revised its recipes over months. Burger King considered making Panini-pressed snack wraps, for example, but tests showed customers wanted something lighter. The wraps it settled on closely resemble the ones offered at McDonald's - a chicken strip sprinkled with cheese, lettuce and dressing wrapped in a flour tortilla. McDonald's even offers the same flavors - honey mustard and ranch. Even seemingly straightforward items had to be reworked over and over. The new "Homestyle Chicken Strips" went through 11 variations before the final version was selected. And it took about seven months and six tries before the company found the right mix of creaminess, iciness and tanginess for its strawberry banana and tropical mango smoothies. "They didn't rush these products out to market," said McDonald, the Burger King franchisee who regularly eats at competitors to stay on top of what they're doing. He said he's confident the new menu items stack up to rivals. "They got feedback from consumers and reformulated them to get it right." But food isn't Burger King's only problem. Many of its restaurants are showing signs of aging. So the company decided it wanted to give them a more modern look that mixes leather armchairs, high stools and plastic chairs in warmer lighting. High partitions will create more privacy in some seating areas. The makeover costs an average of more than $275,000 per restaurant. That presents another challenge: getting buy-in from franchisees, who own 90 percent of the chain's U.S. stores. So the company is offering those who sign up for the remodeling incentives, such as a 50 percent discount on the annual $50,000 franchise fee. So far, more than 1,000 franchise locations are slated to be updated in the next year. Over the next three years, 2,500 will be remodeled. Customers will see changes even in stores that aren't remodeled. The drab red, black or blue shirts workers used to wear have been replaced by metal gray shirts and aprons that were designed with the help of employees. Wrappers, cups and bags now have vivid photos of food that were shot by the same photographer responsible for the catalogs of the high-end housewares retailer Williams-Sonoma. To get the word out about the changes, Burger King is rolling out its biggest marketing campaign ever. TV ads will feature celebrities, including soccer player David Beckham, comedian Jay Leno and actress Salma Hayek. In one spot, R&B singer Mary J. Blige croons the ingredients of the snack wraps. Whether the star power of the ads, updated stores and the new food on the menu can fix Burger King's troubles remains to be seen. But Alex Macedo, chief marketing officer for Burger King North America, said the chain has a good chance of rebounding because Burger King is a brand everyone knows. "People love Burger King and really want a reason to come back," he said.